Trevor Morris knows a thing or two about scoring big, historic moments. From Anne Boleyn's execution on The Tudors to the battling Vikings on History Channel's new series of the same name, Morris has become a go-to for the modern historical tale. 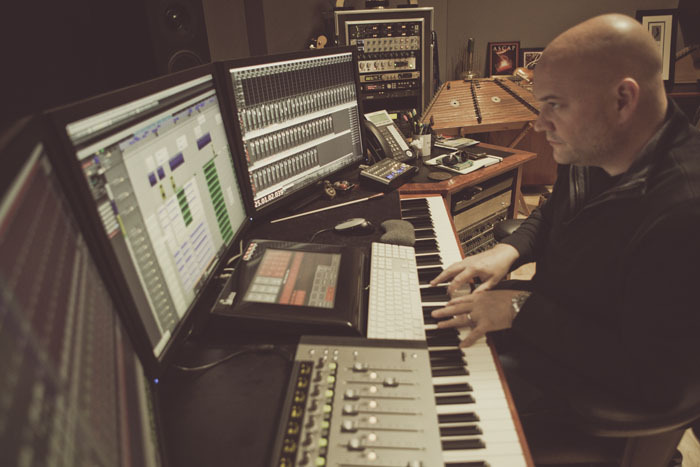 Now Morris is moving from composing for Mount Olympus in movies like Immortal to setting the score on the new action thriller Olympus Has Fallen. Unlike some of his other work, Olympus Has Fallen is set in the all-too-present day where shadowy forces conspire to take down the White House. The movie has some serious star power behind it, including stars Gerard Butler, Morgan Freeman, Angela Bassett, and Aaron Eckhart. What was it like going from ancient history to a modern cautionary tale? I caught up with Morris, currently scoring the third season of Showtime's scandalous papal drama The Borgias, to find out what it was like working on Olympus Has Fallen and why audiences are in for a non-stop thrill ride. What drew you to Olympus Has Fallen? A couple of things, but mostly the director Antoine Fuqua. I'd worked with him before a long time ago on two of his movies in a different capacity. I've always been a fan of his movies. The subject matter spoke to me, it all came together, and I got really excited about working with him. I pursued it mostly for the chance to work with Antoine. It looks like a pretty action-packed movie. How does that impact the score? How do you approach this differently than a more historical project like The Borgias or The Tudors? It's a very contemporary, very now approach to movie making. It's an action thriller approach. After 9/11 we realized almost anything was possible when it comes to these kind of events. This sort of movie could possibly happen. The way we treated the score was to treat it like it was as real as possible. We tried not to Hollywood-ize it too much with the music, but to keep it raw and real and emotional. The approach for the music was to try to keep the experience for the moviegoer as real as possible. What was it that you liked about the film? Oh, there's so much I like about it! I like the subject matter because it's challenging. What if someone did attack the White House? I love the acting, which is fantastic. And of course Antoine's directing is fantastic. It's my kind of movie. It's got action, which is fun for its own reason, but it's also very smart. It's an intellectual puzzle. At the same time it's a thriller, so it just keeps you on the edge of your seat until the very end. You've had a very broad career and you've scored many different genres: film, TV, time periods and more modern stuff like Olympus. Do you have a preference for one over the other? I don't actually. If I had to quantify my preference, in the perfect situation, I want to work on the best story that I can. The genre is not as important to me, whether it's historical, whether it's period, whether it's modern or action or comedy. What I want to work on is a great story. I'm a musical storyteller, that's how I view myself, and I want to work on stories that reach people. Make me feel something about the story and these characters! Once I do feel something about it, then I feel very connected to it. I'm a lover of movies and TV shows, I grew up with them and it's a part of who I am. I love to work with great people too; that's always a real bonus. Antoine is a fantastic human being on top of being a great director, so that was sort of the perfect storm of great things for me. You've done a lot of TV projects and you've also done many films. What's the difference between them? I get asked this a lot and for me, personally, there is not much difference. I know other composers would have a different opinion, which is fine. I approach them very similarly, which is that I try to conceptualize in my head what the music should feel like, if that makes sense. Then I try to approach it from a standpoint of melodic work or melody, where you're trying to find a tune, which is something I feel is a little bit lost now in film scoring. I grew up on the great melodies of Jerry Goldsmith and John Williams and all that. So after I conceptualize the score, if it's a period piece that has a certain flavor to it, and if it's a modern action piece that has a certain flavor to it. Then I try to write some melodies that fit and then write the score. And that approach translates to both TV and film. So for me they're pretty similar. Obviously you've have a really long career so far, but out of all the TV and film projects you've worked on, which has been your favorite and which ones have been closest to your heart? Well that's like choosing your favorite child, it's not possible to do! You know from a movie-making experience just because it's fresh off the heels, Olympus Has Fallen was amazing. Antoine was one of, if not my favorite, directors I've ever worked with. I was a fan before I worked with him and I'm a bigger fan now. As a movie it was great and everything about it was enjoyable. Television is hard because they're all great in their own way and I'm proud of all of them. The Tudors has a special place in my heart because, if for no other reason and not because it's a better show than the rest, it was the first one of those shows. I had done a lot of work before The Tudors, but that show kind of got me on the map by way of the show being so successful and being so unique. I got noticed more because of it, and winning an Emmy didn't hurt either. I'm grateful for that because it was the beginning of this sort of roller coaster ride. So if I had to pick one it would be that, but not because the show's better than any of the other shows, just because it was a moment in time in my life that I'll never forget. Why would you suggest people should definitely plan to go see Olympus Has Fallen when it comes out? There's a ton of reasons! First of all it's a great ride, which is what I want from a movie. I want to spend my ten buckets and get my popcorn and have a great couple of hours and it definitely is that. It's also got great acting, the actors speak for themselves, I don't need to name them off. Again because of 9/11, our perspective on a movie like this is different than it would have been before 9/11. So I think there's something about it that feels like "this could really happen." And the emotional moments are so triumphant in their tragic way. There's a lot of emotion in the movie. It's not just a "blow up the White House" kind of a thing, although that happens, obviously. There's an intellectual part which is great. Then there's a thrill ride, action, pulse-pounding kind of thing, as well. It's firing on all those cylinders for me. It's the sort of movie I would go see regardless, even if I wasn't working on it. And Antoine's a great director. It's a great ride, and it's got a few more layers to it than the typical action thriller. It's going to appeal to that kind of an audience. Olympus Has Fallen comes out in theaters Friday, March 22nd. And check back close to The Borgias' April 14th season three premiere for the second part of my talk with Morris, where we discussed what's coming up on the Showtime drama and the continuing influence of that other historical drama, The Tudors.